Originally, this Interstate was to traverse extreme northern Pennsylvania from Erie to Scranton along the US 6 alignment when the initial Interstate routings were published on August 14, 1957. On June 27, 1958, the Bureau of Public Roads changed the route of the Interstate because of a change in the routing of Interstate 80 across the Commonwealth. The 1964 Department of Highways map was the first time the public would see the future Interstate 84. Its gray, dashed line stretching from Interstate 81 in Moosic to the New York state line over the Delaware River in Matamoras. The Department of Highways would start changing that gray dashed line into a green dashed line as construction began in Pike County between Spring Road west of Lords Valley to Sawkill Road in 1967. The following year, construction was extended westward to Beaver Dam Road just east of PA 507 and eastward to Palmer Road northeast of Milford. However, with the progress taking place in Pike County, the news was not so good in Lackawanna. 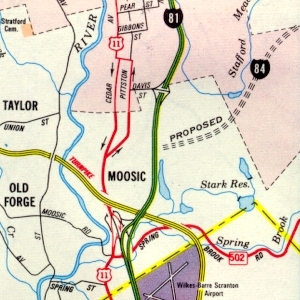 That year it was determined that the Moosic Mountains would prove to be an engineering challenge, and require an alteration in the proposed alignment. 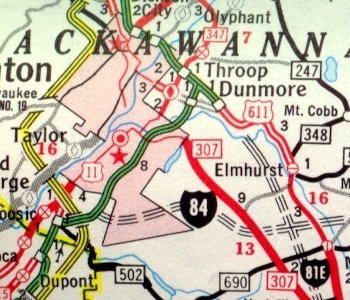 The Department of Highways moved the western terminus north on Interstate 81 to its current location, creating a multiplex with then Interstate 81E. Construction on an Interstate-grade highway had occurred from Interstate 81 to Tigue Street which began in 1960 and finished in 1961, thus creating the route to Scranton. Proposed routing of Interstate 84 west of the current Interstate 380 alignment as indicated in 1967. Construction continued in 1969 as work was extended eastward and westward again. To the west, it was extended to just west of PA 191 and eastward to the first exit inside New York. The first section of Interstate 84 to open would be the bridge spanning the Delaware River in 1970, while it would be two more years until a section of Interstate on land would open. In 1972, the section from Exit 26 to Exit 53 opened to traffic. The following year work was extended west for a second time to Aberdeen Road southwest of Drinker. Also in that year, the section from Exit 1 to Exit 2 was upgraded to Interstate standards. In 1974, work was extended westward a third time to Exit 8 while another section opened to traffic from Exit 17 to Exit 26. Construction began on the massive Directional T interchange between Interstate 84 and Interstate 380 in 1975, which also included a section to the PA 435 overpass. In 1976, the section between Exit 8 and Exit 17 opened while construction began on the section from the PA 435 overpass to Exit 8. As the Interstate opened piece by piece, PennDOT decided to mark the exits using mileage-based exit numbers beginning in 1975. A mere two years later, they were switched to sequential numbering. Mileage-based exit numbers would reappear on Interstate 84 in 2001. Finally, the last section to open between Interstate 380 and Exit 8 occurred in 1978. In the 1990s, most of I-84 was rebuilt with the last part the interchange at Interstate 81. This was occurring as the Lackawanna Valley Industrial Highway, now known as the Robert P. Casey Highway, was being connected at the same interchange. This massive interchange opened in October 1999. We all know why the chicken crossed the road, and it seems at least 250 of them knew as well on the morning of September 6, 2012. State Police and PennDOT were sent out to a section in Dunmore after receiving calls from drivers who spotted chickens running free and more than a dozen crates filled with chickens on the side of the Interstate. No one knows how the chickens got there, but it was more than likely a truck hauling chickens that somehow lost its load without the driver knowing. The Interstate was not closed because the chickens were resting off to the side of the travel lanes. PennDOT workers gathered and delivered them to the Griffin Animal Pond Shelter. A major rebuilding project began on October 29, 2013 between Exit 46 and the New York state line. Initial work entailed building crossovers to move traffic from the westbound lanes to the eastbound lanes and in Spring 2014, the rehabilitating work will begin. The project will include replacing the eastbound and westbound lanes, rehabilitating seven bridges, building a new bridge, rehabilitating five culverts, retaining wall, sanitary sewer work, new guiderail, drainage, and pavement markings. Work is expected to cost $66.4 million and finish in April 2016. The primary need for this is the ongoing failure of the existing pavement due to alkali silica reactivity (ASR). ASR causes the pavement to deteriorate due to a reaction between the aggregate and cement that was used in the early 1970s during construction. The concrete can form a gel that may absorb water which expands and cracks the concrete. This Interstate has a twin on the other side of the country which runs between Portland, Oregon and Echo, Utah. Information courtesy of the Pennsylvania Department of Transportation and The Citizens' Voice.